I took this image of the Moon last week and posted it on Flickr, but I wanted to make sure to share it here as well. 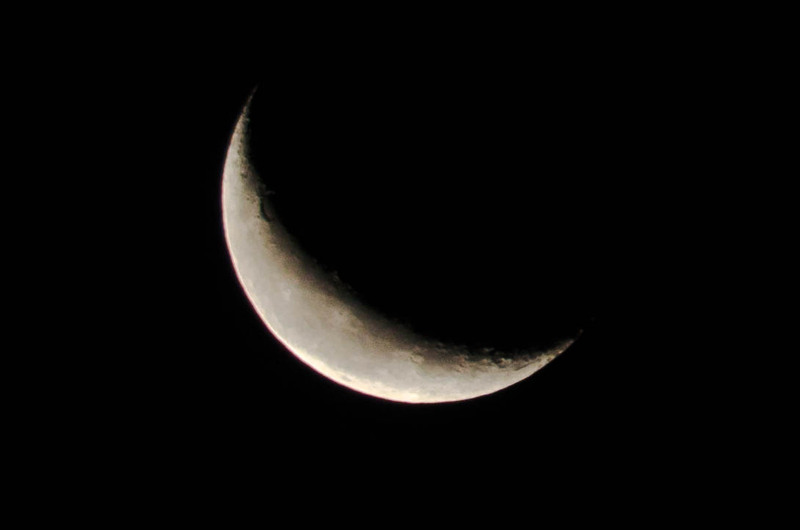 It’s a waning crescent, which I took on a manual setting around 5:45AM. I took this image with my 300mm lens at full extension with ISO set to 125 and the shutter speed at 1/200 second. After some serious Lightroom developing, and a significant crop, the image yielded some surprising detail! I adored taking astronomy when I was in college. In fact, I took two semesters of the subject, and then worked as a lab assistant the first semester of my senior just so I could keep using the telescopes. Having a DSLR doesn’t quite take me back to 1995, but I am pleased nevertheless. It amazes me how we can capture images of huge craters, and even mountain ranges, on a celestial body with something as simple as a camera! In the future I’d like to get an astro photography tripod mount. This would allow me to do long exposures of the stars and do tracking shots of the moon, both of which would bring out some wonderful details. Long exposures of constellations actually bring out the different colors of the stars, and the detail of long-exposure moon shots is phenomenal.